I happen to really like Starbucks coffee. I worked there for a while and even though some people say Starbucks over roasts their beans I happen to really like dark heavy coffees. So it pains me to see this, a flavored coffee from Starbucks. I think adding flavoring to coffee beans is a really bad idea. I think it’s cheap and makes your brand seem cheap. I think Starbucks beans are a pretty good quality and great for every day brewing. Come on Starbucks, what are you doing, don’t do that. I can see the Via instant brew getting flavored coffees because, lets face it, it’s instant coffee. 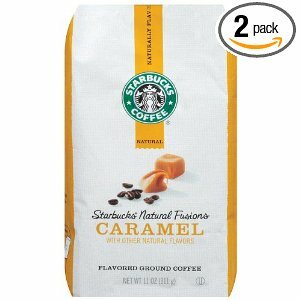 The Starbucks naturally infused flavored coffees are only for sale in stores not at Starbucks coffee shop locations. At least Starbucks knows to keep that stuff out of their coffee shops. Flavored coffees have no place in proper coffee shops. So I shed a very small tear for Starbucks as they sell out even more to the bad coffee loving public of America! I actually tried the vanilla and the caramel in your old Starbucks store location this morning. Both were the most terrible freaking coffee I’ve ever had. There’s no gas station coffee in the world that is worse than than miserable excuse for drinking hot flavored liquid. The employees had samples of the coffee and many were drinking it themselves. It was over the top sweet and the flavor was simply reprehensible. I’m feeling a little nauseous thinking about it now actually. This was a terrible idea. The marketing exec who thought this up should be taken out back and force fed this crap until he pukes. It makes me mad, because I generally describe Starbucks as decent to good coffee and it’s available everywhere. It’s not great coffee and it never will be. But, no matter what city I’m in, I can get a decent to good cup. This drops it down a notch for me…. and it’s even a bigger drop than when they started selling that Via, their instant coffee. I might just have to start roasting my own coffee. From what I understand the flavored coffee is only in retail stores and not in actual Starbucks locations. If they have brought the coffee to store locations it’s a sad day for coffee lovers.